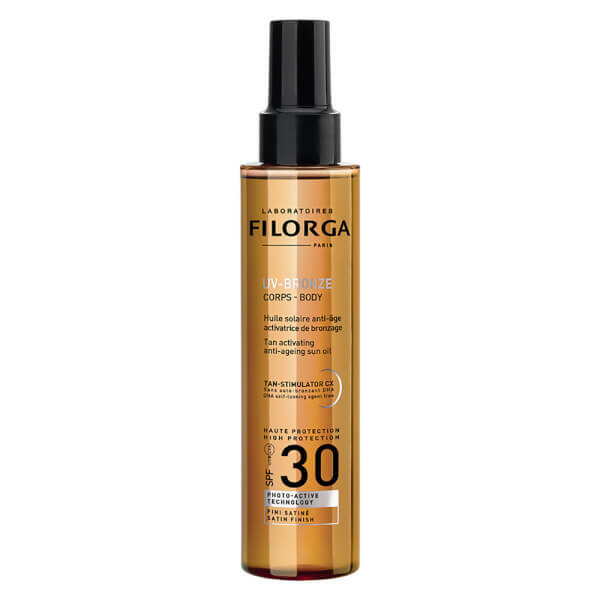 Protect skin from harmful sun exposure with the Filorga UV Bronze SPF30 Body Oil; a tan-activating anti-ageing sun oil that protects skin and speeds up the tanning process in complete safety. Enriched with UV filters and a Global Anti-Ageing Shield (a powerful antioxidant that is activated by the sun’s rays) the body oil provides high protection, whilst Hyaluronic Acid envelopes skin leaving it nourished, moisturised and intensely toned. Also infused in the formula is a Tan-Stimulator Complex, a melanin booster that accelerates the natural tan for a luminous complexion. 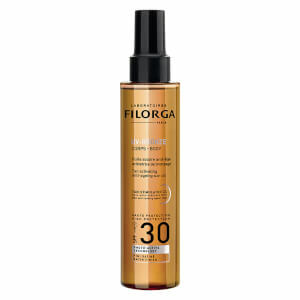 Apply enough product for an even layer over the face before sun exposure, and repeat often, especially after going in the water or drying your skin. Although your skin is well protected, avoid sun exposure during peak sunshine hours. Excessive sun exposure is dangerous.